When he met Julian Assange for the first time, Sigurdur Thordarson admired the WikiLeaks founder’s attitude and quickly signed up to the cause. But little more than a year later, Thordarson was working as an informant spying on WikiLeaks for the US government — embroiling himself as a teenager in one of the most complicated international events in recent history. In a series of interviews with Slate, Thordarson has detailed the full story behind how, in an extraordinary sequence of events, he went from accompanying Assange to court hearings in London to secretly passing troves of data on WikiLeaks staff and affiliated activists to the FBI. The 20-year-old Icelandic citizen’s account is partly corroborated by authorities in Iceland, who have confirmed that he was at the center of a diplomatic row in 2011 when a handful of FBI agents flew in to the country to meet with him — but were subsequently asked to leave after a government minister suspected they were trying to “frame” Assange. Thordarson, who first outed himself as an informant in a Wired story in June, provided me with access to a pseudonymous email account that he says was created for him by the FBI. He also produced documents and travel records for trips to Denmark and the United States that he says were organized and paid for by the bureau. The FBI declined to comment on Thordarson’s role as an informant or the content of the emails its agents are alleged to have sent him. In a statement, it said that it was “not able to discuss investigative tools and techniques, nor comment on ongoing investigations.” But emails sent by alleged FBI agents to Thordarson, which left a digital trail leading back to computers located within the United States, appear to shine a light on the extent of the bureau’s efforts to aggressively investigate WikiLeaks following the whistle-blower website’s publication of classified US military and State Department files in 2010. Late last month, Army intelligence analyst Bradley Manning was convicted on counts of espionage, theft, and computer fraud for passing the group the secrets. During the Manning trial, military prosecutors portrayed Assange as an “information anarchist,” and now it seems increasingly possible that the US government may next go after the 42-year-old Australian for his role in obtaining and publishing the documents. For the past 14 months, Assange has been living in Ecuador’s London Embassy after being granted political asylum by the country over fears that, if he is sent to Sweden to face sexual offense allegations, he will be detained and subsequently extradited to the United States. Meanwhile, for more than two years, prosecutors have been quietly conducting a sweeping investigation into WikiLeaks that remains active today. The FBI’s files in the Manning case number more than 42,000 pages, according to statements made during the soldier’s pretrial hearings, and that stack of proverbial paper likely continues to grow. Thordarson’s story offers a unique insight into the politically-charged probe: Information he has provided appears to show that there was internal tension within the FBI over a controversial attempt to infiltrate and gather intelligence on the whistle-blower group. Thordarson gave the FBI a large amount of data on WikiLeaks, including private chat message logs, photographs, and contact details of volunteers, activists, and journalists affiliated with the organization. Thordarson alleges that the bureau even asked him to covertly record conversations with Assange in a bid to tie him to a criminal hacking conspiracy. The feds pulled back only after becoming concerned that the Australian was close to discovering the spy effort. It was 2010 when the saga began in Reykjavik, Iceland. Thordarson, then just 17, says that before his first encounter with Assange, he knew little about the man beyond a few YouTube videos he’d watched about WikiLeaks. But he went to hear Assange speak at a conference hosted by an Icelandic university, and the teenager was impressed. After the event, a journalist Thordarson knew introduced him to Assange, and the pair struck up a relationship that led to Thordarson doing some volunteer work for the organization. Before long, he was on the edges of WikiLeaks’ small, tight-knit inner circle. Thordarson, a blond-haired stocky figure with a baby face, was present while WikiLeaks staff and volunteers in Reykjavik were preparing the video for publication. When it was published by WikiLeaks in April 2010, under the name Collateral Murder, it catapulted the organization into the international spotlight and provoked an angry response from government officials in Washington. The then-teenager, known as “Siggi” to his friends, was around at the height of that backlash. He was given administrative privileges to moderate an Internet chat room run by WikiLeaks. And when Assange relocated from Iceland to England, Thordarson came to visit. He even accompanied the WikiLeaks founder to court appearances in London as he fought extradition to Sweden over allegations of sexual assault. 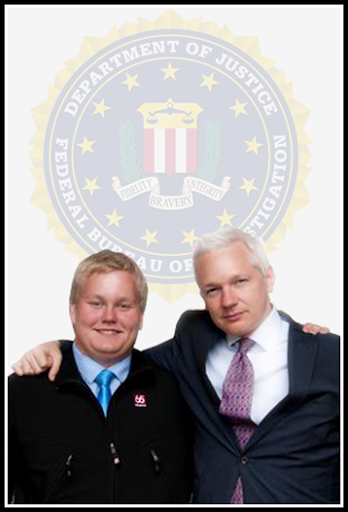 Thordarson looked up to Assange, viewing him as a friend. The WikiLeaks chief, he says, treated him well — helping him find a lawyer in 2010, not long after the pair had met, when he says he was wrongly accused by Icelandic police of breaking into a business premises. But signs that Thordarson had a proclivity for brushes with the law did not appear to trigger alarm bells early on at WikiLeaks — though perhaps they should have, because he was certainly not any ordinary volunteer. Unlike many drawn to WikiLeaks, Thordarson does not seem to have been principally motivated by a passion for the cause of transparency or by the desire to expose government wrongdoing. Instead, he was on the hunt for excitement and got a thrill out of being close to people publishing secret government documents. As a child, Thordarson led a fairly normal middle-class life in Reykjavik, enjoying social studies and chemistry at school. His father worked as a sales manager at a painting firm, and his mother ran a hair salon. But as he entered his teenage years, he says, he began to feel that he could not connect with others in his peer group. He went to college to study computer science and psychology — but claims he was suspended after hacking into a college computer system.